We will not go into why I spent a ot of time in bars as a child, but I do clearly remember the value of a well-programmed jukebox. There's something about the stretched out steel of guitar strings and the languid spread of lyrics over a concrete-floored barroom populated by those seeking the ease of the end of the day through communion, food and a good sip of something tasty. The Rockin' Pig fits this well, a red-walled edifice sprawling over the end of a shopping center parking lot, oiled by a steady stream of customers and tinted by the tunes, from Steely Dan's "Josie" to Steve Miller Band's "Fly Like An Eagle" to Meatloaf's "Paradise by the Dashboard Light" - a playlist of jukebox favorites, a portal straight back to 1977. However, the jukebox doesn't sit on the floor any more. 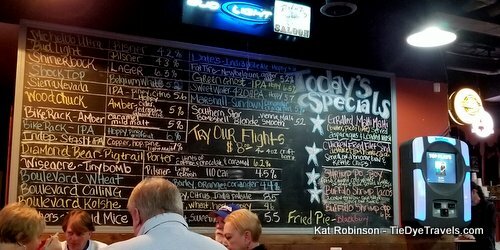 Instead, the color-changing light panels flank an electronic station situated on the wall next to an oversized blackboard marked with all the brews on tap and the specials of the night, cattycorner to a raised stage with white walls, rock motifs painted on in hard black. 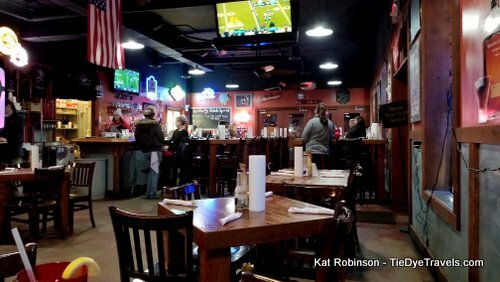 A long bar stretches out the other way from the jukebox, a big L that probably finds itself leaned on and packed when motorcycle enthusiasts find their way to Arkansas's Switzerland of the Ozarks. In 1977 I turned all of four years old (catch me sometime and I'll pontificate on the oddness of my rather complete memory of places and lack of memory of certain faces from the four decades that have passed since) and yet I do recall places like the Rockin' Pig so very clearly. It is a credit to its owners and staff that the aesthetic is preserved at an establishment opened in, I believe, 2013. On a bitingly cold January night, not so much. However, my late arrival into town meant a lack of great dining experiences, and while I have long been comforted by Cathouse Lounge's delectably cured Reuben, I was seeking other sustenance. 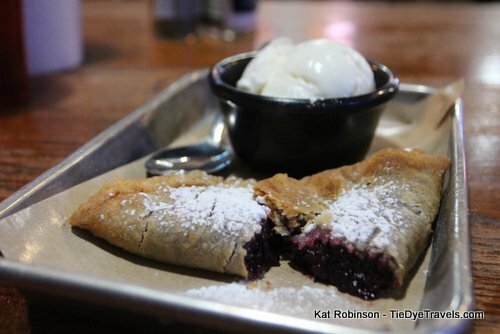 Being on the Great Arkansas Pie Hunt, that included a bite of pie. 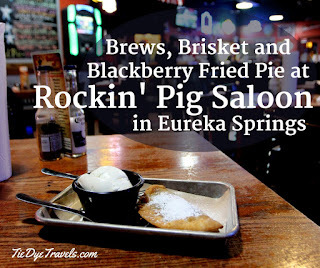 Fried pies are on the menu at the Rockin' Pig, and I was going to have myself one before the night was over. I was also going to have dinner, which I had passed up on the impromptu trip to town where I'd stopped in to shoot pie in Conway, Greenbrier, Leslie, Marshall and Harrison. I wasn't going to be able to properly crash out at the Wanderoo without something substantial in my belly. 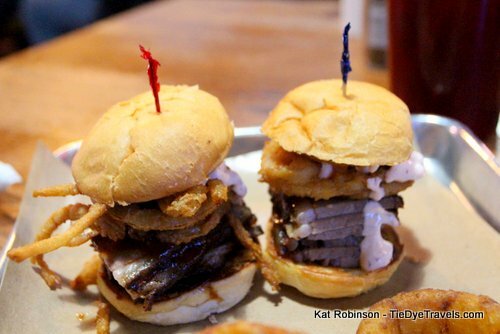 While I did briefly consider the brisket asada tacos and the Wagyu beef burgers (please, don't get the idea this place is uppity - but the menu might convince you otherwise), I knew from the moment I set my eyes on the brisket sliders I'd be delving into them that particular Saturday night. After all, the term "chipotle cream" got my engine running. Tied to beef, fried onions and barbecue sauce, of course I was all in. I even went for onion rings as opposed to fries for that double-onion goodness. 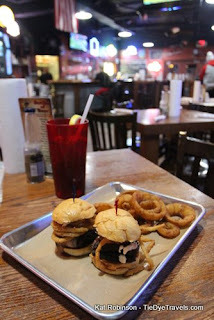 I was getting myself some smokehouse barbecue sliders. 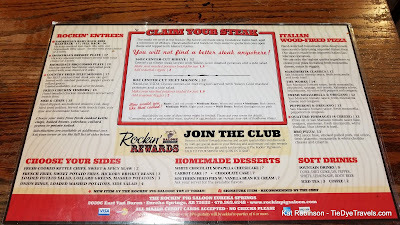 I didn't see a single plate the entire time I was in the Rockin' Pig. Instead, everything came on metal trays - which is pretty smart for a place where alcohol is often consumed. I was solo, so I stuck to the iced tea and watched the crowd instead. I didn't have long to wait for my sliders - I suspect just enough time to fry those onions - and I was heartened by the height of those little sandwiches right off the back. The brisket was sliced about 3/16ths of an inch thick, and with six slices depth of brisket slices on each sandwich there was better than an inch of meat on each bun alone - topped with those onion strings and doused lightly but well with that barbecue sauce and the cream. The onion rings were all right. inhaled. That's what they were. Inhaled. I was hungry. They were soft and meaty and then they were gone. I have no regrets. In fact, had I not been seeking pies, I might have settled up right then and called it a night. But I had to shoot pie and try pie, and there's always a box, right? 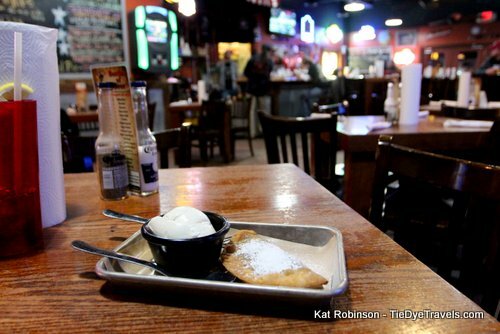 It only took a few minutes to receive my right-then-fried pie with a sidecar of vanilla bean ice cream. Rockin' Pig offers one fried pie flavor every day, and I happened to luck out and get blackberry this particular Saturday. Within, I didn't find that gooey gel-like filling I've had other places. 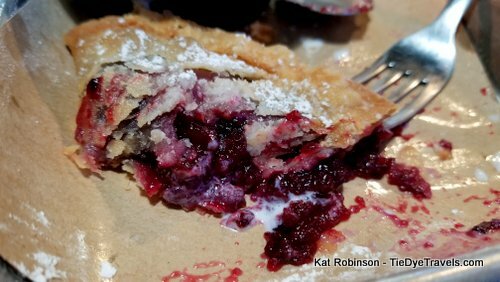 This was a gorgeously butter-packed flaky crust packed with whole blackberries that had been rendered down to a more concentrated form with just a bit of sugar and what tasted like a touch of lemon juice. Simple. I'm sorry, someone left the portal to 1977 open. Egads. I don't know, don't think Rockin' Pig set out to offer some time traveling with dinner and a drink, but that's the sort of experience I had with the pie, the ice cream and that jukebox that had moved on to Skynyrd and, a little incongruously, the Doors' "Five To One." 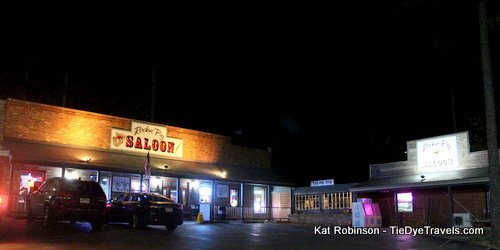 It made for an interesting evening, one that wasn't lost on me when I returned to the Wanderoo's mid-century motorcourt's similar timewarp. I suspect Rockin' Pig will become one of my cycle of restaurants I enjoy when I sojourn in Eureka Springs, alongside favorites such as Local Flavor, Mei Li Cuisine and others. It's mid-range in price, and that brisket. Man, that brisket. 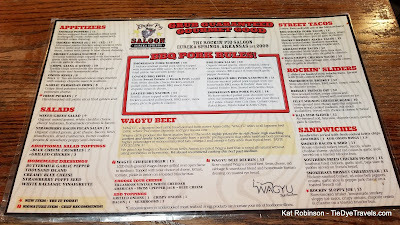 You'll find the Rockin' Pig Saloon at 2039C East Van Buren (US Highway 62) on the east side of Eureka Springs. It's open every day 11 a.m.-8:30 p.m. and an hour later on Friday and Saturday nights. 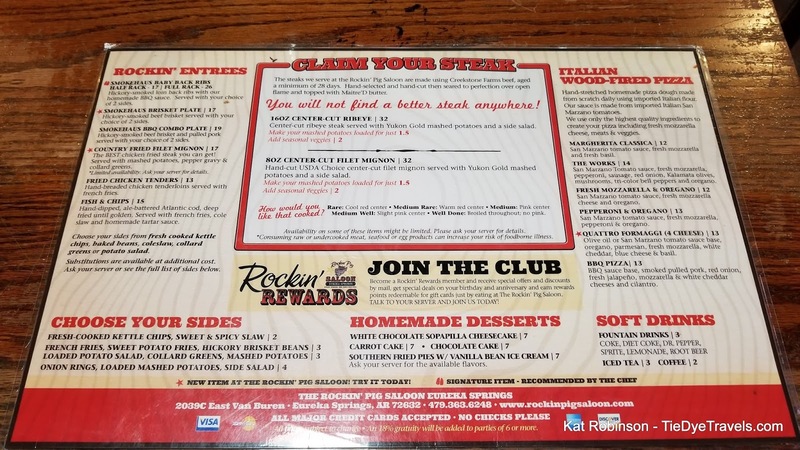 For more information, call (479) 363-6428 or check out the website.